Here, you will learn how Entity Framework tracks changes on entities during their life time. Entity Framework supports automatic change tracking of the loaded entities during the life-time of the context. The DbChangeTracker class gives you all the information about current entities being tracked by the context. Please note that every entity must have a key (primary key) property in order to be tracked by the context. 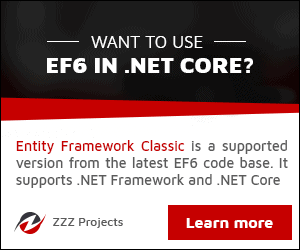 Entity Framework will not add any entity in the conceptual model which does not have an EntityKey property. Context tracking changes of 1 entity. Context tracking changes of 2 entities. Context tracking changes of 3 entities. As you can see in the above sample code snippet and output, the context keeps track of entities whenever we retrieve, add, modify or delete an entity. Please notice that context is alive during any operations on entities. The context will not keep track if you do any operation on entities that is out of its scope.